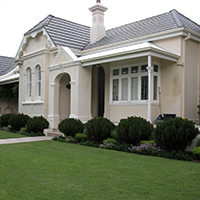 Zoysia grasses are quickly gaining popularity in Queensland and subtropical regions. Their drought and humidity tolerance makes them an excellent choice, but one of the things that makes Zoysia stand above the rest is that it is more resistant to pests and diseases and best of all it is lower maintenance in these climates, they are slower growing and therefore less mowing is required. Drought and other factors can play a big part in how good or bad your lawn looks. But to keep your lawn looking great may be easier than you think, consistent and regular care is the secret. The question of where to start always comes up, this article will help you answer this and many other questions. 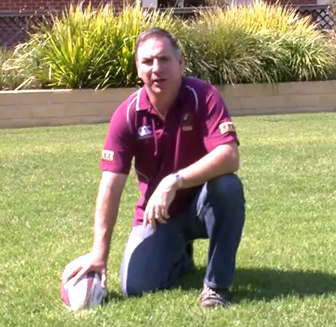 Click Here to find out how to keep your lawn looking great. Aussies on most internet turf forums are discussing EZ Grass. This is the nick name for Empire™ Zoysia Turf. So what makes Empire™ so easy to look after? research shows that eating Zoysia is actually harmful to these lawn caterpillars. There is lots of research that Empire™ is far more drought tolerant than buffalo turf. With it’s deep rhizomes it can survive dry far longer than most turf types but it’s the beautiful soft appearance that attracts most people to Empire. House after house looking great year after year with such little effort. No wonder it’s getting such good raps from lawn professionals. People are amazed at how little thatch it produces and the fact that unlike many Zoysia types this lawn can easily be mown with any type of mower. 30% less than buffalo grass. Why mow when you could be doing more fun things like playing on your Empire™ lawn or relaxing. Empire™ turf can be mown short or long allowing you to play Bocce or even back yard cricket. It is so wear tolerant that it’s often used for sporting venues and high-wear areas in parks. You can’t do that with buffalo. Most lawns simply cannot tolerate the wide variety of climates that Empire™ can. It did the best in floods, it survived years of drought, it lives in cold temperatures that would easily kill all kikuyu and buffalo types. t loves the humidity of Queensland even if it is a wet year. It just gets far less disease and insect damage. Empire™ performs with up to 40% shade, it’s herbicide tolerance is legendary and best of all Empire™ will do well with much less fertilizer than all other grass types. It has been proven to strengthen the soil more than other turf and if you need evidence to back these claims up just download the referenced research document . The BUT for Empire™ is not to lay it in winter in Sydney, Perth Adelaide and Melbourne as it will root out too slowly. Queensland is generally warmer so you can get away with it for most of the year. In the warmer months Empire™ strikes really quickly. Whether it’s grubs, floods, drought, humidity, cold, disease, wear or scalping, Empire™ just keeps on surviving. Make your next lawn not only the most beautiful in the suburb, make it the toughest. Choose Empire™ Zoysia Turf. Us Queenslanders… we’re a little different. That’s why we need a grass that’s made for us. Empire™ Zoysia is best suited to tropical and sub-tropical climates. Sounds like Queensland to me. Empire™ Zoysia loves heat and humidity, does better than other lawns in the wet, but is proven by research to be far more drought tolerant than Buffalo turf. It does well in full sun to 40% shade, and handles wear far better than Buffalo turf. You see unlike Buffalo grass, Empire™ Zoysia has underground runners, allowing it to reshoot if damaged, and helping it survive whatever Queensland throws at it. Drought, wet, heat, humidity, and cold. Yes, Empire™ Zoysia is even far more cold tolerant than Buffalo. Research shows Empire™ Zoysia needs 30% less mowing than Buffalo, and 50% less than Couch. It does great on the Queensland coast, and is far less susceptible to pests and diseases. Research has shown Army worm would much rather eat Couch and Buffalo than a Zoysia. So let them eat your neighbor’s lawn. Empire™ Zoysia keeps weeds out well, but if they do get in, they can be sprayed out. If you get Paspalum or other grass weeds in Buffalo, then you must hand weed them. But just remember, if you have more than 40% shade Buffalo is a better alternative than Empire™ Zoysia. One of the main reasons you would use Empire™ Zoysia is because it’s so beautiful. Just look at these lawns. There’re darker green, softer, and look better than any other lawn. 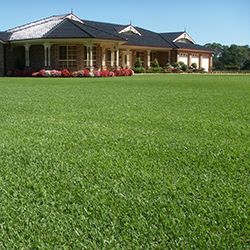 Empire™ Zoysia will make your neighbours green with envy, just like our footballers do to New South Wales most years. Empire™ Zoysia is often used on roadsides in Queensland, but more and more professional Queensland Landscape Architects and designers are switching to Empire™ Zoysia for high class Queensland landscapes. Queensland’s a tough place for a lawn, so take my word for it, Empire™ Zoysia’s the lawn you need. Empire™ Zoysia, it’s our home turf.